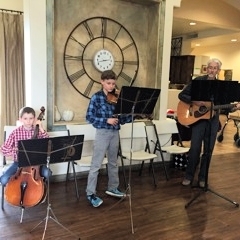 QUEST CONNECTS is an outreach performing arts ministry designed to serve the seniors in assisted living communities in Tucson. Our goal is to build relationships between generations through the performing arts including dance, music and acting. Quest Connects' shows are interactive and encourage the kids the interact with the older generation! This outreach program is run by Amy Stahlman. You can learn more about her on our Staff Bio page. You can also contact her if you have any questions at amygstahlman@gmail.com or call her at 891-2888. Right now our outreach takes place primarily at the Friendship Villas Retirement Community. However, we are always looking for new ways to reach out into the community. If you know of anyone that may be interested, please contact us! Stay tuned for more information on next year's performances! "Our residents will be excited to hear that you will be back as they have been asking! The variety of the shows as well as the energy of the children can not be replicated. So thank you for all your hard work in putting these together!!"